Oracle Service Bus 11g – Another session operation is in progress. Please retry later. Since our Bamboo pipeline uses the same account for deployments we sometimes get this error “Another session operation is in progress. Please retry later.” during deployment. So 1st of all, don’t use the same user (like weblogic) to deploy when your with a lot of developers / build pipelines / etc. Time for us to use multiple users for each agent (or think of something else really smart), but in the meanwhile we sometimes have to discard the changes from an open session. However sometimes the sbconsole does not allow this action and we need to restart the Admin + Managed server. Usually this fixes the issue, however this time it didn’t. I downloaded patch 20380158 and used opatch to install it on my DEV environment. 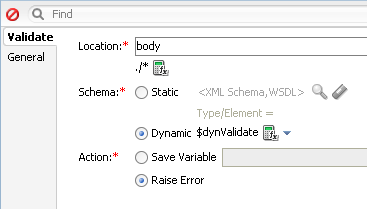 I first use an Assign action in my pipeline to create the $dynValidate variable with XQuery which holds the XML structure for the validation. (You could also use the xquery directly on the validate action). 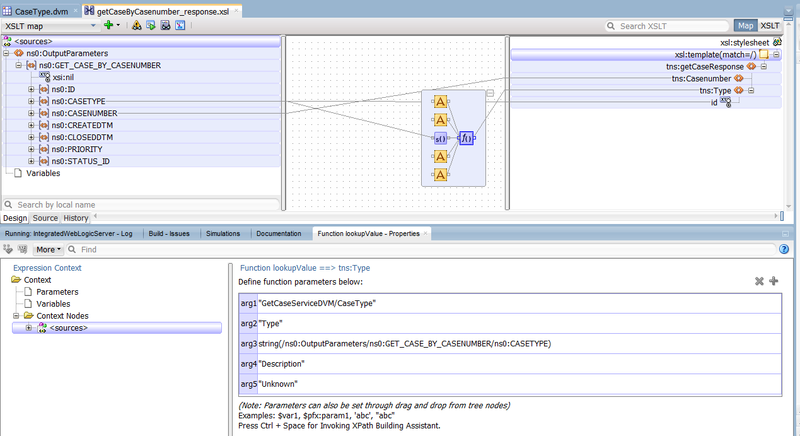 After we have the $dynValidate variable we can use it as input for the Validate action. 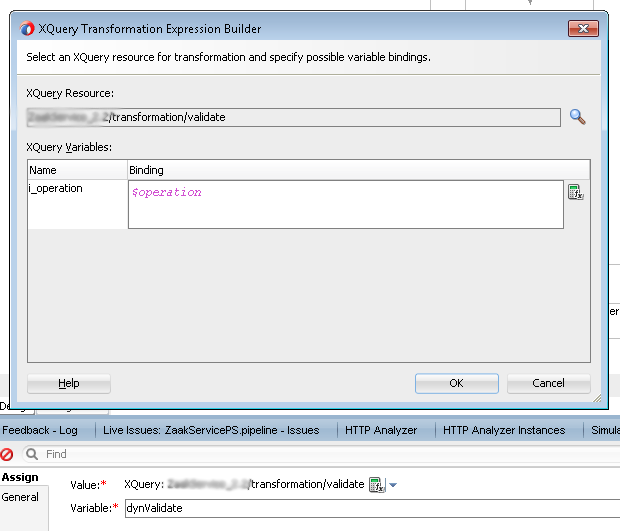 (As mentioned, you can also directly use the Xquery here instead of an expression with the earlier generated variable. 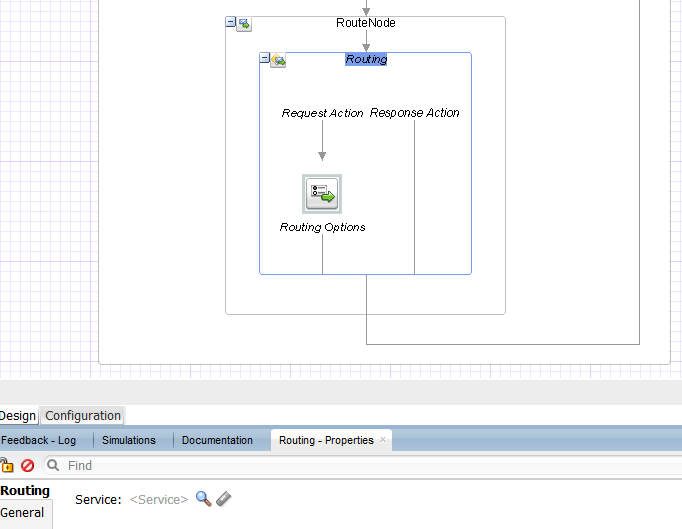 One of the new features in Service Bus 12c is the ability to use pipeline templates. Usually the Oracle Service Bus pipelines in an environment have many common steps. 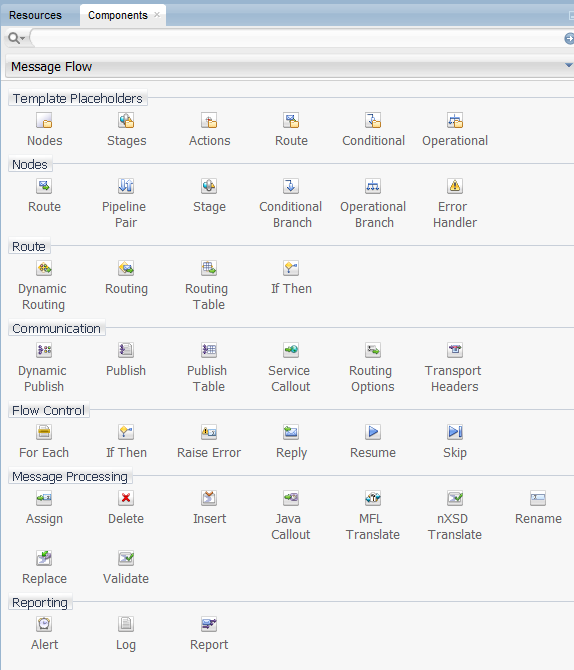 Think of the re-use of logging, error handling, alerts and pattern + naming convention for your stages. In practice with OSB 11g we often used a “template” or existing OSB project which we then copied and modified. 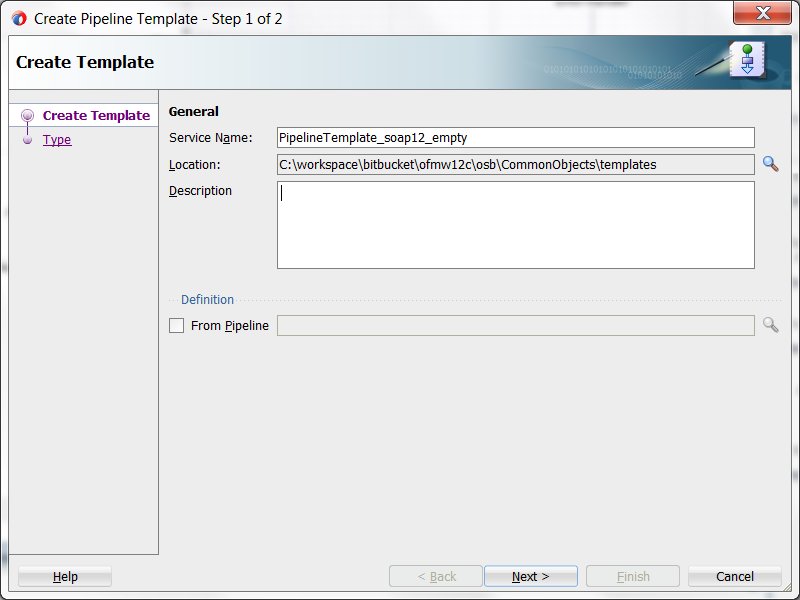 With the “clone” option of 12c this task is already easier, but the use of pipeline templates is even better. Since templates and concrete pipelines (generated pipelines from a template) remain linked we can update our services easier with new insights. For example, when you want to change your default logging or fault handling behavior. 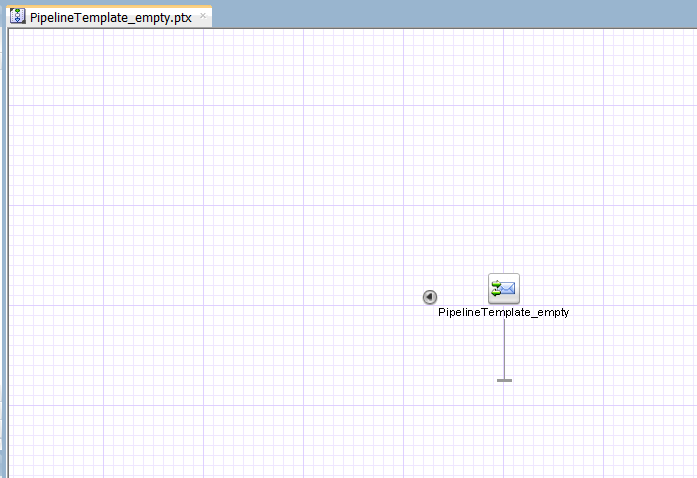 To use pipeline templates to their fullest potential we can customize them to our own needs. For this we have multiple options. The essential configuration of most actions can be left empty in the template without any problem. As soon as they are implemented in concrete pipelines the actions there will come into an ERROR state. 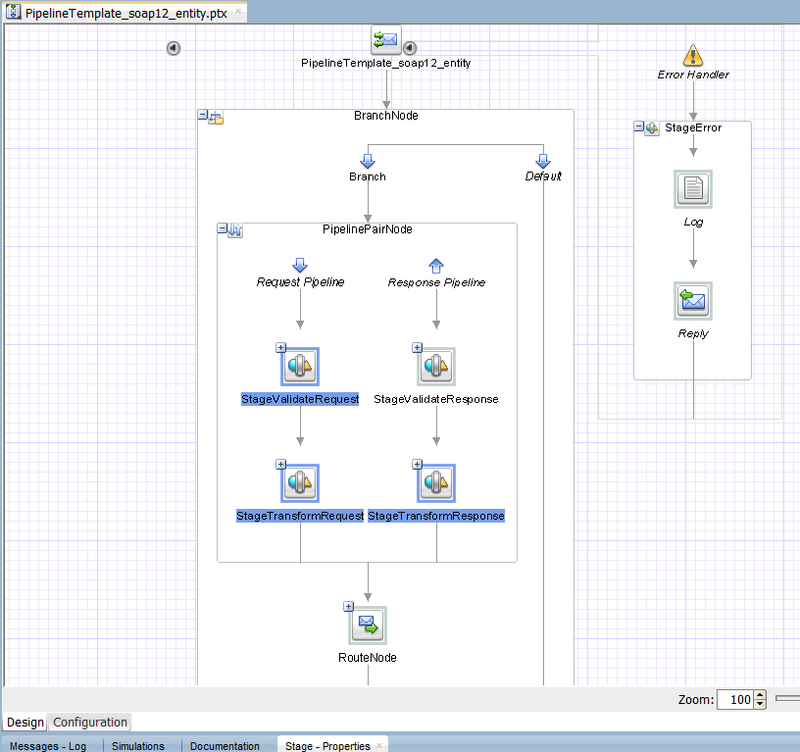 The example below shows the Routing which is empty in the pipeline template. When developing the concrete pipelines we can then easily set the correct business service. Many actions, like Validate, allow us to use generic configuration of the Location instead of specific elements from the service datamodel. By using generic configuration as ./* we can tell the Validate action to validate the 1st element in the SOAP body. Which normally would be your getMessageRequest or getMessageResponse element. The correct element and schema to validate against should still be selected in the concrete pipeline. 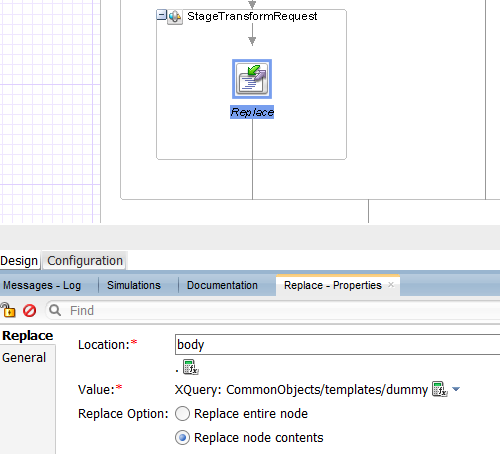 Unlike most actions, the problem with the Replace action seems that when you leave the XSLT or XQuery of choice empty, the template will turn into an error state. To prevent this from happening I use a dummy XQuery file in my CommonObjects project and assign it from all Replace actions I use for transformation of messages..
We can set each individual action in our template to a “locked” state. With this preventing the developer of the concrete pipeline to change certain locked logic of the service. This is quite usefull for default logging and fault handling you want to enforce in your services. Right-click on each specific action you want to lock and choose “Lock Action”. Sadly there is no graphical representation to quickly show you which actions are locked. We can use template placeholders to allow developers using the template to customize the concrete pipeline to the extend that we determine in the template. We can allow customization of unlimited stages, nodes and route, but in most cases you will probably use the most strict placeholder “Actions”. 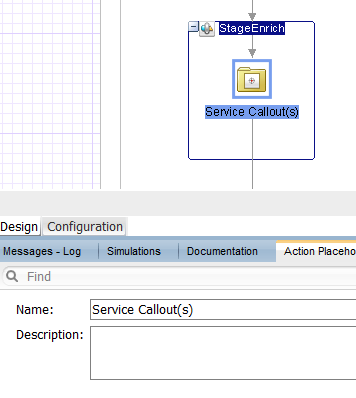 In the example below we show a stageEnrich which allows the developer to add unlimited amount of actions in this stage. Actions like Service Callouts, Transforms, Logging, etc to make sure we can extend our service. With this, creating enough flexibility for the developer to customize the logic for the concrete pipeline, without changing the default we want to enforce for logging, error handling, etc. Just use the search on patch number ‘20423408’ and it will bring you the patch details page with the download (approx. 662MB). So I patched my own JDeveloper 12.1.3 environment with the OPATCH tool. OPatch detects the Middleware Home as "C:\Oracle\Middleware\12.1.3"
Patch [ 20423408 ] conflict with patch(es) [ 19707784 ] in the Oracle Home. To resolve patch conflicts please contact Oracle Support Services. If you continue, patch(es) [ 19707784 ] will be rolled back and the new Patch [ 20423408 ] will be installed. OPatch will roll back the subset patches and apply the given patch. OPatch back to application of the patch '20423408' after auto-rollback. We can generate a new concrete pipeline on an existing service bus overview, or generate a new service. In this example we will generate a whole new service which implements the concrete pipeline. The concrete pipeline is linked to the original pipeline template and will also change automatically when the template is updated. Since the earlier generated “PipelineTemplate_soap12_entity” will be used, we will create a basic entity service named getEmployeeService in this blogpost. 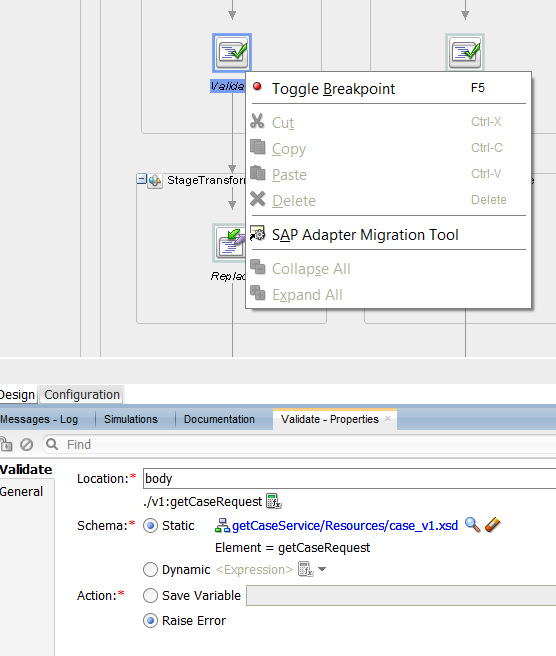 Use the wizard to generate a new Service Project and drag a Pipeline to the service bus overview. We select the “From Template”. 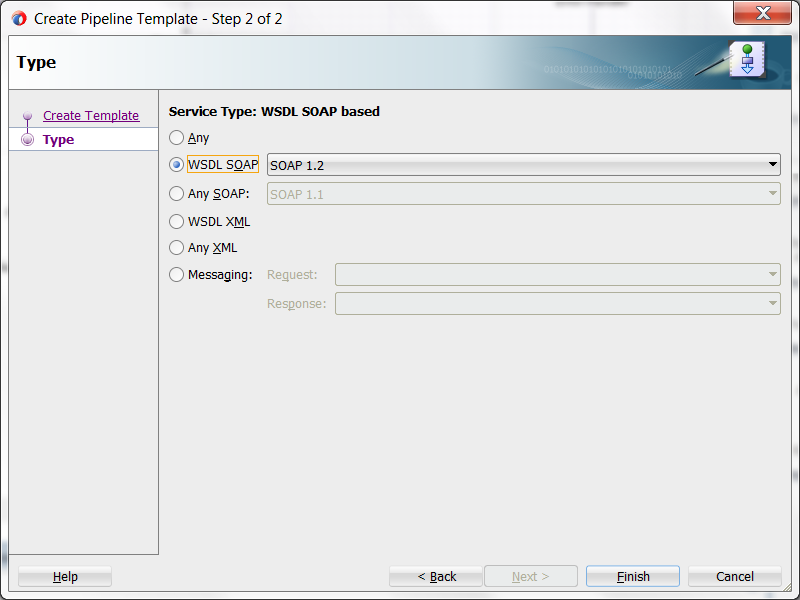 We then need to select a SOAP 1.2 WSDL since this is the transport used in the template. We can not delete the action since the concrete pipeline actions are inherited from our template. The action contains the default configuration from the original template. In this case we did not modify the template yet after the generation.. So however the templates help us to quickly generate basic message flow patterns, we still should make sure we check our actions.. 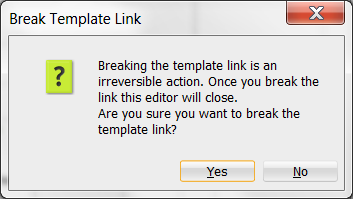 If we want to edit the concrete pipeline beyond the scope of the pipeline template we can break the template link. By doing so the concrete pipeline becomes a normal pipeline. However this break can not(!) be undone. 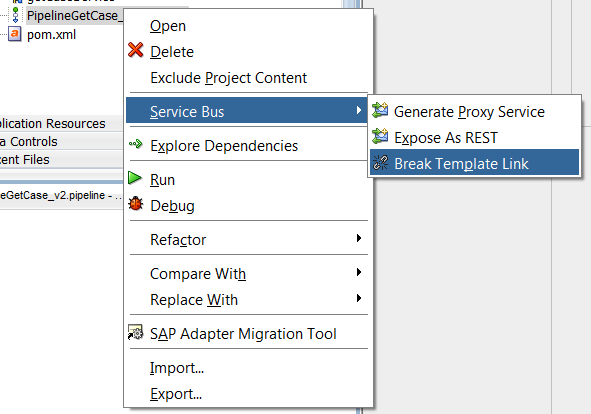 Right-click on the concrete pipeline and select Service Bus -> Break Template Link. Then select YES regarding the warning about the irreversibale action. 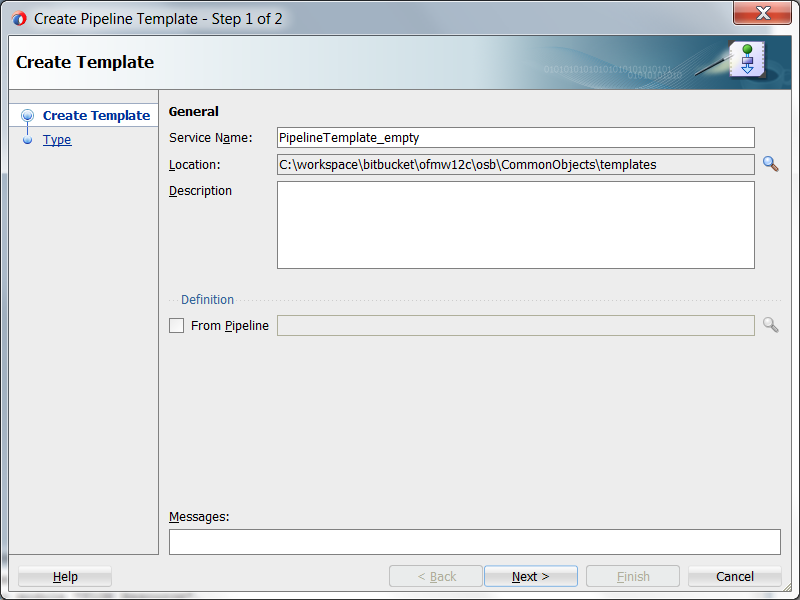 There are multiple ways to create pipeline templates, in this blogpost we will show 2 common options. In this example I will use a common project in my JDeveloper SBApplication named “CommonObjects” with a folder “templates” to host my templates. In the next wizard step we can select a name for the new template. For now we will leave the “from pipeline” option empty. For the template naming convention I have chosen to include the transport choice (in this case SOAP 1.2). The result is an empty template which you can customize by adding message flow actions from the Components palette. However in most environments you will likely have some existing services which contain logic that you want to re-use in the form of pipeline templates. In that case we we can repeat the step New -> Pipeline Template. 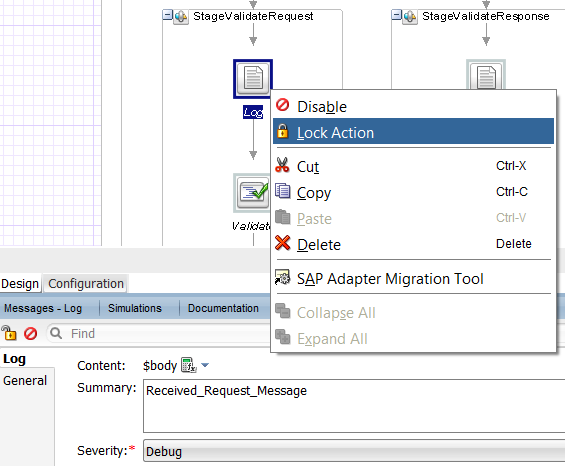 However this time we select the “from pipeline” option in the wizard. In the example we will generate a pipeline template from our earlier created entity GetCaseservice. The purpose is to use the newly created the new PipelineTemplate_soap12_entity for multiple new SOAP 1.2 entity services we will generate in the near future. The result is a basic template we can re-use for our new pipelines / services. 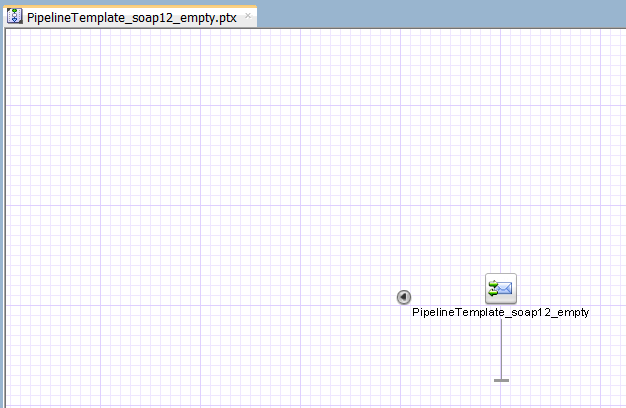 You cannot create pipeline templates in the SB console, only in JDeveloper 12c. You can however see template resources in the SB console project navigator. 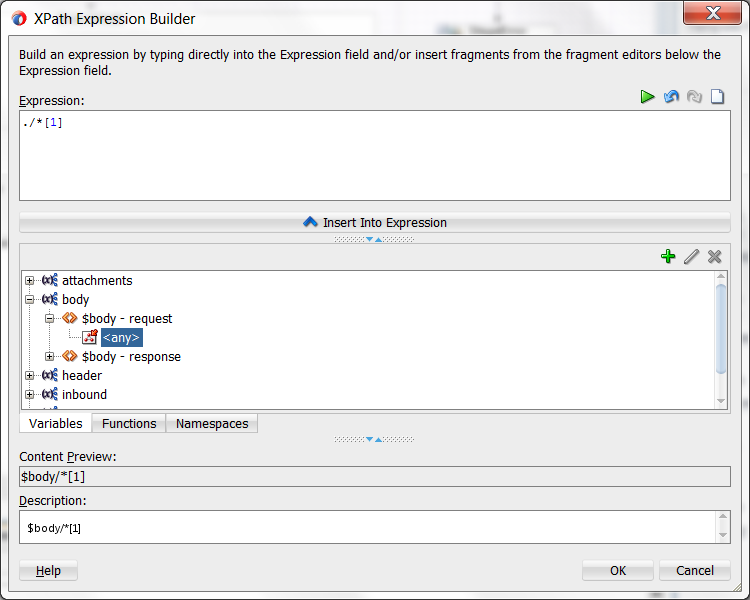 You can manually refresh your templates in JDeveloper. You will need this from time to time and for some reason these are seperated from your application artifacts regarding refresh options. 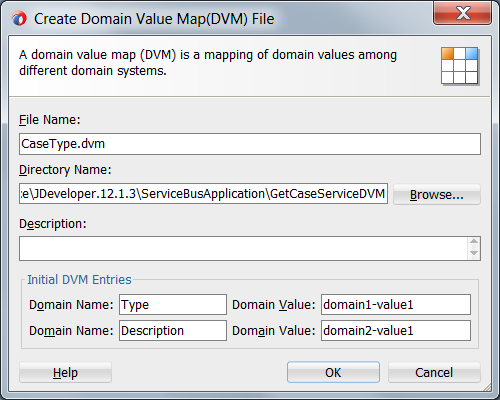 Due to the tighter integration of Oracle Service Bus 12c in the whole Oracle SOA Suite product it’s now much easier for developers to use general SOA Suite components like the Domain Value Map (DVM). The file name and description speak for themself. The Initial DVM Entries forces us to define the minimum amount of 2 domain names (source and target of our value) and if we want we can inmediately configure the 1st record here. 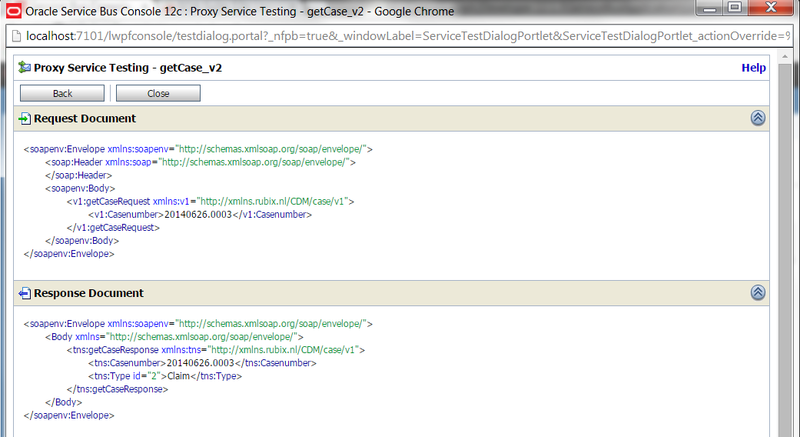 The result is a DVM file in our project which we can easily edit within JDeveloper 12c. For this blogpost we will add 2 records which will allow us to translate the value “1” and “2” which we receive from the database to a basic description of that value. 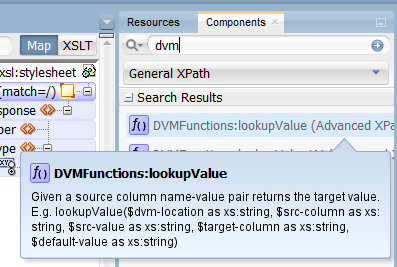 In our XSLT transformation we can drag the DVMFunctions:lookupValue on our canvas. If we test the result we see that the source element with value “2” is succesfully translated to the “Claim” value.